Delayed replication allows a replication slave to deliberately lag behind the master by at least a specified amount of time. Before executing an event, the slave will first wait, if necessary, until the given time has passed since the event was created on the master. The result is that the slave will reflect the state of the master some time back in the past. This feature is supported since MySQL 5.6 and MariaDB 10.2.3. It can come in handy in case of accidental data deletion, and should be part of your disaster recovery plan. The problem when setting up a delayed replication slave is how much delay we should put on. Too short of time and you risk the bad query getting to your delayed slave before you can get to it, thus wasting the point of having the delayed slave. Optionally, you can have your delayed time to be so long that it take hours for your delayed slave to catch up to where the master was at the time of the error. Luckily with Docker, process isolation is its strength. Running multiple MySQL instances is pretty convenient with Docker. It allows us to have multiple delayed slaves within a single physical host to improve our recovery time and save hardware resources. If you think a 15-minute delay is too short, we can have another instance with 1-hour delay or 6-hour for an even older snapshot of our database. Take note that we are going to have 3 copies of the exact same data on the same physical server. Ensure our Docker host has the storage required, so do allocate sufficient disk space beforehand. This backup file will be used by the MySQL slave containers during the slave bootstrapping process, as shown in the next section. "mysql.conf.d" directory will store our custom MySQL configuration file and will be mapped into the container under /etc/mysql.conf.d. "datadir" is where we want Docker to store the MySQL data directory, which maps to /var/lib/mysql of the container and "sql" directory stores our SQL files - backup files in .sql or .sql.gz format to stage the slave before replicating and also .sql files to automate the replication configuration and startup. ** The server-id value we used for this slave is 10015. Next, under /storage/mysql-slave-15m/sql directory, create two SQL files, one to RESET MASTER (1reset_master.sql) and another one to establish the replication link using CHANGE MASTER statement (3setup_slave.sql). Take note that we prefix the SQL filename with an integer to determine the execution order when Docker initializes the MySQL container. ** The MYSQL_ROOT_PASSWORD value must be the same as the MySQL root password on the master. 2018-12-04T04:05:24.890244Z 0 [Note] mysqld: ready for connections. ** The server-id value we used for this slave is 10060. Next, under /storage/mysql-slave-1h/sql directory, create two SQL files, one to RESET MASTER (1reset_master.sql) and another one to establish the replication link using CHANGE MASTER statement (3setup_slave.sql). ** The server-id value we used for this slave is 10006. Next, under /storage/mysql-slave-6h/sql directory, create two SQL files, one to RESET MASTER (1reset_master.sql) and another one to establish the replication link using CHANGE MASTER statement (3setup_slave.sql). If you are lucky enough to realize it immediately, you could use the 15-minute delayed slave to catch up to the moment before the disaster happens and promote it to become master, or export the missing data out and restore it on the master. $ mysqlbinlog --start-datetime="2018-12-04 14:35:00" --stop-datetime="2018-12-04 14:55:41" /var/lib/mysql/binlog.000004 | grep -i -B 25 "drop column"
In the bottom few lines of the mysqlbinlog output, you should have the erroneous command that was executed at position 19379556. The position that we should restore is one step before this, which is in position 19379491. This is the binlog position where we want our delayed slave to be up to. To protect against user mistakes on the master. 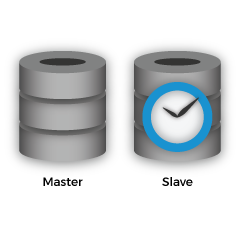 A DBA can roll back a delayed slave to the time just before the disaster. To test how the system behaves when there is a lag. For example, in an application, a lag might be caused by a heavy load on the slave. However, it can be difficult to generate this load level. Delayed replication can simulate the lag without having to simulate the load. It can also be used to debug conditions related to a lagging slave. 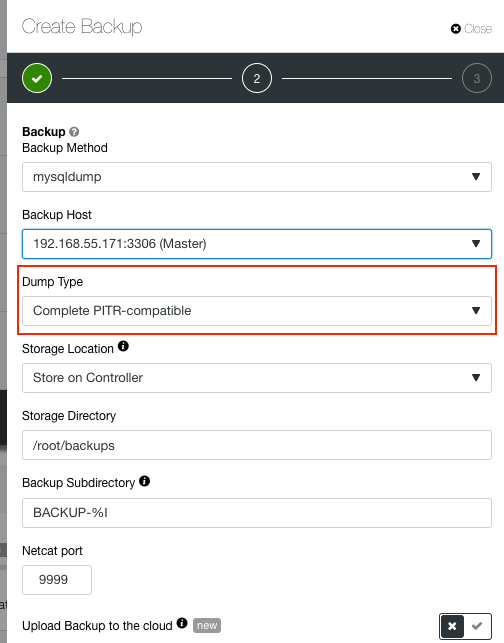 To inspect what the database looked like in the past, without having to reload a backup. For example, if the delay is one week and the DBA needs to see what the database looked like before the last few days' worth of development, the delayed slave can be inspected. 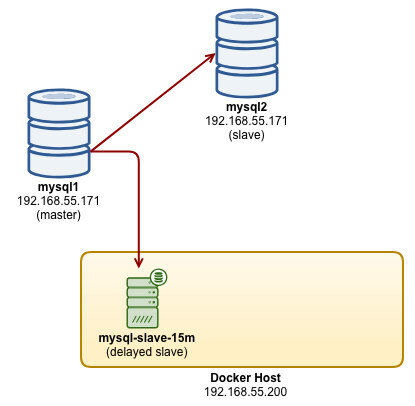 With Docker, running multiple MySQL instances on a same physical host can be done efficiently. You may use Docker orchestration tools like Docker Compose and Swarm to simplify the multi-container deployment as opposed to the steps shown in this blog post.